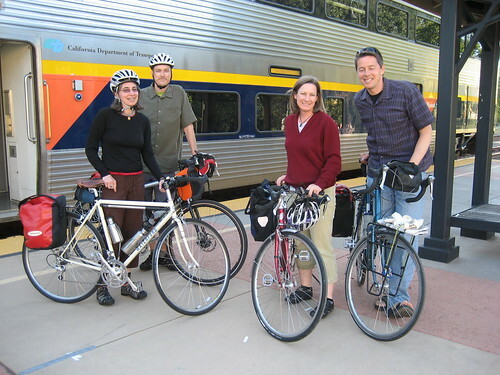 There is no better feeling than getting away for a long weekend by train……..with bikes. Looking for yet another unique car free getaway and hot off the high of our week long “spring ride”, I noticed that the Capital Corridor seemed to have one train a day that actually went all the way to Auburn, which is an hour further east than Sacramento and firmly up into the foothills of the Sierras. Hmmm…? How can we turn this into a weekend bike getaway? Catching the 3:30 train from Jack London Square was easy, even on Friday afternoon as you beat the BART bike ban hours from the city which start after 4. We opted for Oakland versus Richmond so we’d be starting at the beginning of the line, but you can do an easy transfer at Richmond between BART and Amtrak. If you opt for Lake Merritt BART, it’s just a 5-minute bike ride to Jack London Square. 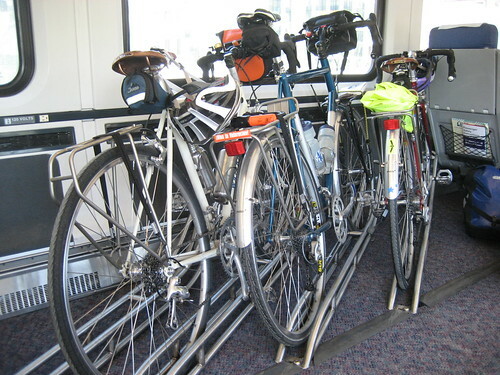 We knew that there are about 4 train cars with 3 bike hooks each; however, even sweeter is the bonus 4-bike floor rack in the first car which made our loading and unloading stress free and easy. 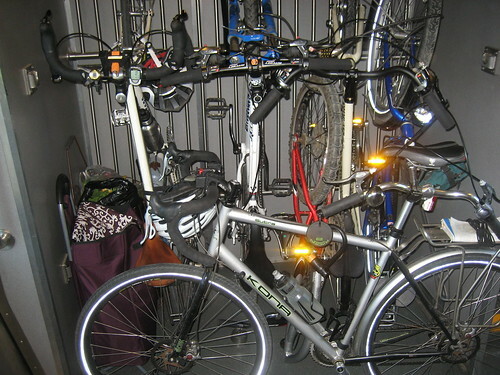 New 4-bike floor rack is sweet! So unlike your normal long weekend race to get out of the city by car to get to your getaway, our getaway began as we boarded the train. 4-person table seats…check….Anchor Steam….check….views of the bay…check. And right on time to Auburn by 6:30 where we headed by bike to our one night layover at the Holiday Inn, just 5 minutes away. There are not a lot of good car-free hotel choices in Auburn as it has been immensely scarred by I-80 splitting its heart in two; however, the HI is new and has a courtyard pool and hot tub which felt great and got us all in the vacation mood prior to walking to Old Town. There is one large event focused (read weekend weddings) B&B near Old Town which you could try as an alternative as the Holiday Inn was predictably soulless and a bit pricey. 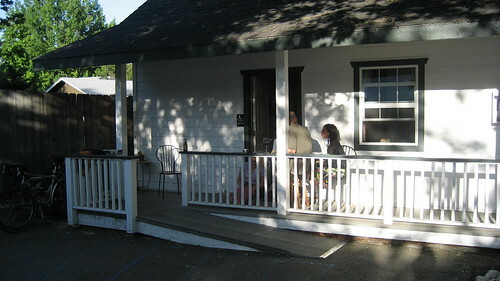 Also, they accommodated us away from the Freeway side of the hotel in quieter courtyard rooms, so ask. (Despite their denial that any of their rooms had freeway views?!)….o.k. I agree, half of the rooms have a parking lot view over an In-n-Out Burger, with the freeway right behind that. Perhaps they should classify those rooms as “American View”. We also didn’t mention the bikes in detail at check-in..just asked if there was an entrance outside to our rooms as this is always better than rolling them through the lobby. If you do go through the lobby, just be confident and certain that you’d be taking the bikes to your room as most places don’t have much experience with bikes and will aim to please, especially if you are pleasant. It’s an easy 20 minute walk to Old Town from the hotel which passes under the freeway, but Auburn has clearly made an attempt to soften the Caltrans effect by adding some streetlights and a decent sidewalk . Old Auburn is nice and we had a great outdoor meal at the Brewery, with a mandatory 12 beer sampler …..a huge bargain at 6 bucks, with good enough sized “samples” to fill the whole evening. Did I mention that people are friendly up in Gold Country. Across the board, everyone was very nice, and no attitude which is definitely a vacation from SF. So the next morning, a 10 minute walk got us to the “Auburn Breakfast Club” in a strip mall (leave that Bay Area attitude at home now). After loading up on yummy eggs and pancakes (but disappointedthat we didn’t see Molly Ringwald?! ), we were inchin’ to get on the bikes and ride. We had only about 30-35 miles to cover to Grass Valley, and we knew it was mostly uphill as Auburn is at El 1200 and Grass valley is at 2400 feet with lots of ridges, creeks and river valleys to cross. So we picked up some sandwiches from the adjacent supermarket as there would not be much civilization on the roads we’d be taking. 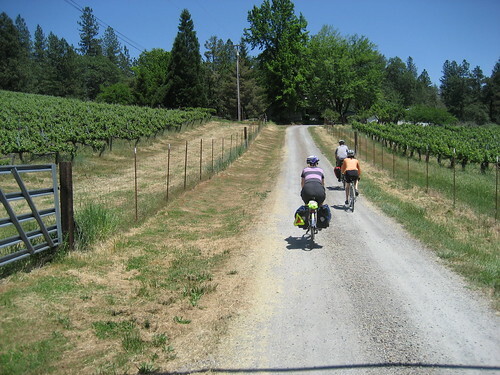 However, the ride was beautiful in the late spring, especially once you get to Placer Hill and Dog Bar Roads outside of Auburn. The Bear River also made a nice lunch stop and cold dip break, although a little cold and shallow to “swim”. Dog Bar road takes you up a big ridge and right by Smith Vineyards which we couldn’t pass up as they are only open for tasting Sat afternoons from 1-5, and low an behold, it was Sat afternoon between 1 and 5. Good karma on this trip. 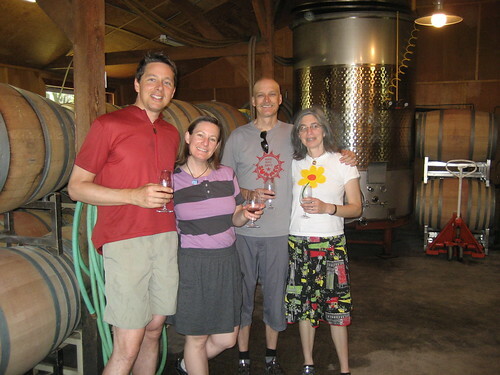 First bike wine tasters at Smith Vineyards! We detoured to the hilly Rattlesnake Road and soared into Grass valley by 3 p.m. Grass Valley has a pleasant downtown and adjacent old neighborhoods, and we stayed at the wonderful little “Sierra Mountain Inn” Very well run with pleasant and comfortable rooms. We got adjoining end rooms with one kitchenette, so we could hang out together and even ordered pizza in the second night after a full day of riding up through Nevada City to the Yuba River. You can easily walk to town in 10 minutes and there are loads of restaurants but it’s down a short steep hill, so biking takes a little effort from the Inn. 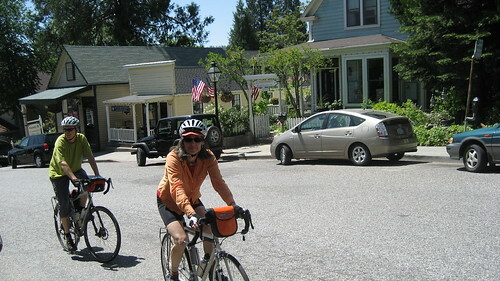 We stopped in Nevada City both for a coffee break and beer break on each end of our rides to the Yuba River. Nevada City is even more picturesque than Grass Valley with a large creek adn canyon adjacent to town that makes it more dramatic. Very pleasant cycling roads and weather, but it is very hilly, so this is not touring receomended for flatlanders. 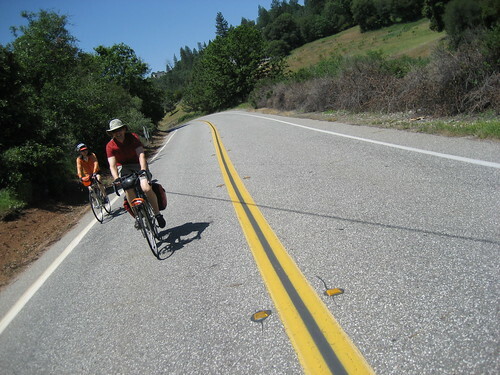 The Yuba River State Park is accessed off a few different roads but we opted for a hilly but farily quiet looking road past the private Lake Vera. The last mile or so is dirt as the Lake Vera-Purdon road decends about 800 feet down to the Yuba River. 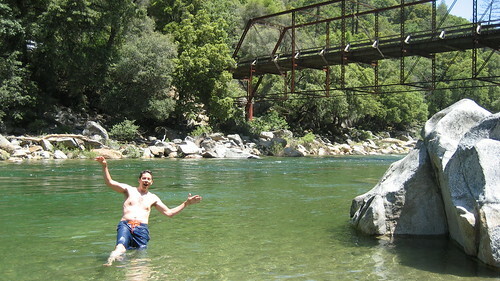 A refreshing swim in the Yuba River! After two nights in Grass Valley, we packed up Monday morning with lots of food and water and headed towards Folsom. It was over 50 miles to Folsom, but the roads were MOSTLY downhill and it was get warmer as the day went on, so we were all spent by the time we got to Folsom Lake for a late lunch and in time to see the lines of cars trying to get to the lake. All the roads in had been closed, but we just sailed by on our bikes, so happy not to be joining the majority of Americans stuck in the Memorial Day traffic tradition. We hooked into the American River bike trail at the lake and cruised to Folsom where we caught the light rail to Sacramento . The ride is less than an hour and costs only $2.25, with each little car taking two bikes at front and rear only, but we jammed 4 bikes in the back of the front car as bikes are not allowed in the front of the front car, despite the seats being adjustable and having two bike hooks. The 10 minute transfer to the Capital Corridor was hectic as the jazz fest was breaking up and there were a lot of bikes getting on the train. We all made it work by placing extra bikes on the 3 hooks or just in front of them. You can lock your bike to itself if you are sitting elsewhere, but just make sure to chat with anyone whose bike you may be parking in so you can move it as needed. A little crowded on the Capital Corridor return! « South by bike with no car. Hey, that’s my daily commute train (the Roseville to Sac leg)! It looks like a fantastic weekend – thanks for sharing. Zorry to post here, but I couldn’t find an e-mail contact. I found your blog through StreetsBlog SF and was hoping you might be interesting in participating in a great event I’m working with. I’m an intern working with the group TransForm in Oakland to promote our Car-Free Challenge. I’m looking for local bloggers who would (a) be willing to write about the challenge and (b) be willing to take the challenge and or tell their friends to. The info about what we’re doing is at (http://www.transformca.org/live/car-free-challenge) and it’s perfectly OK to sign up even if you’re already car-free. Trains and bikes are a great combination, and I notice you’ve even got a low floor entrance. I often use the train with my bike-in fact I plan bike ridea along rail lines so I can get home if I’m not up to the pace. They’re a bit more frequent here though.